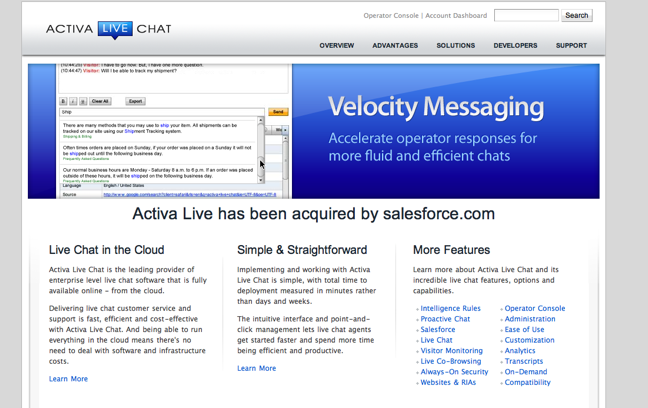 It appears that Salesforce has just acquired enterprise chat startup Activa Live. We’ve confirmed the acquisition with Salesforce. Activa Live develops Activa Live Chat, an enterprise, on-demand live chat software for customer service, support and online proactive sales interactions. The software allows companies to monitor, identify and engage with online visitors in real-time, helping increase sales and customer satisfaction. The software also includes a feature that reveals what a visitor is typing before their message is sent and helps live chat agents find the best answer for customer questions without searching through libraries of canned responses. Activa is also offered as an app on Salesforce’s App Exchange. Activa is available in both a browser-based version and a desktop version for all platforms. The company’s technology is used by Best Buy, American Apparel and a number of other high-profile brands. While details are still unclear, we’d assume that Active Live Chat will be integrated into Salesforce’s Service Cloud, a SaaS customer service platform. Recent Salesforce acquisitions include Sitemasher, and Jigsaw.